Durable and fashionable hammock stand with hammock with bolster pillow, rust-resistant zinc-plated steel chains and hanging hardware included. Swing away the days troubles; ignite a book idea or just daydream yourself into a deep sleep. This hammock stand with hammock will bring you endless hours of calm and relaxation. Ultra spacious, awesomely affordable and crafted to last a lifetime. And because this piece is made from the sturdy synthetic Texteline fabric were confident you'll appreciate the extra levels of stability and comfort this hammock offers. Whether you reside in a beach-side bungalow or your home is a bit more landlocked, you can enjoy island-inspired unwinding with this charming chair hammock. It comes with two cushions, the size of the hammock is 50.4 x 50.4 inch and the maximum weight is 308 lbs. 100% canvas cotton. Featuring a hanging design that's perfect for the porch, it is crafted of polyester and cotton with a colourful stripe motif that effortlessly stands out. Just grab a good book and a glass of freshly-squeezed lemonade for a relaxing day outdoors. When the stars start sprouting up in the sky above, there's no need to head inside! Just pull up a weathered wood end table and add on a flickering candle lantern for a warm glow sure to light up your night. Though this chair is lovely all on its own, you can always make it more cozy by tossing on a linen pillow or a knit tassel-trimmed throw blanket. The 15ft ARC Hammock Stand in Aluminum with a stunning powder coated finish is the perfect option for Vivere's spreader bar hammocks. Its curved square beams make a unique, modern design while providing stability and a capacity rating of 450 lbs. The non-rusting aluminum material is lightweight making it easy to move in your backyard. Ends come with plastic caps for safety and durability. Ensure ample space is available for this 15 foot long stand. The 15ft ARC Hammock Stand in Steel is a perfect fit for Viveres spreader bar hammocks. Made with heavy duty steel and a powder coated finish, its round curvy poles make a design statement while providing stability, rating up to 450 lbs. It assembles quickly, with no tools being required. Ends come with rubber caps for safety and durability. Ensure ample space is available for this 15 foot long stand. Vivere's 15ft ARC Wicker Rattan Hammock stand is intricately woven with an all-weather polypropylene. You can have peace of mind as its maintenance free and assembles with ease. The attractive brown tone rattan finish, wrapped around each 3 sided beam, is a great match for your backyard. The hardware is zinc coated steel to ensure a clean, long lasting finish. This stand can be complimented by any of Vivere's double spreader bar hammocks. Ensure ample space is available for set up of this 15 foot long stand. 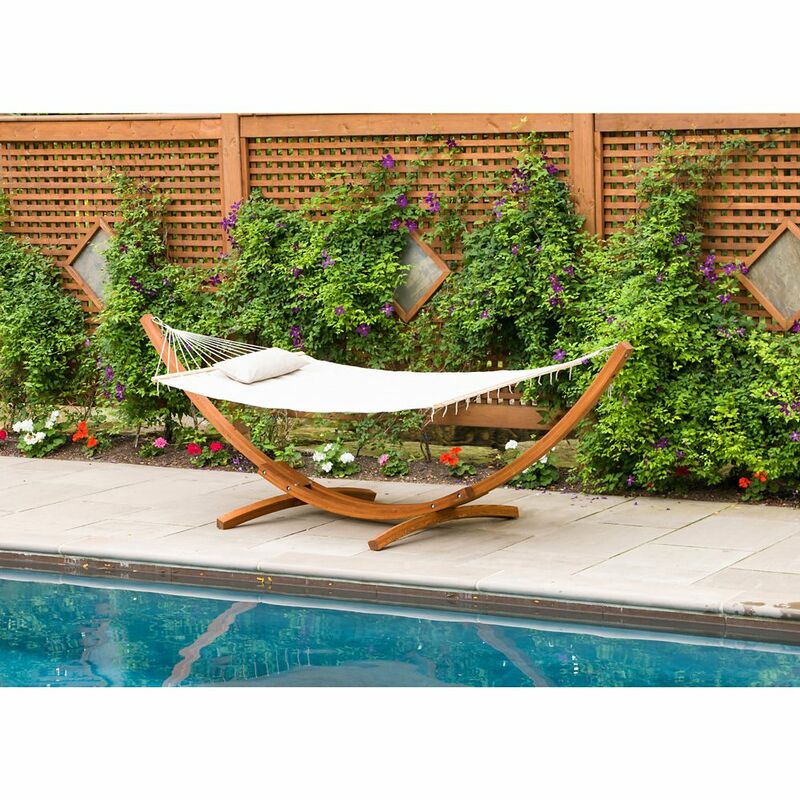 Hammock Stand with Hammock Durable and fashionable hammock stand with hammock with bolster pillow, rust-resistant zinc-plated steel chains and hanging hardware included. Swing away the days troubles; ignite a book idea or just daydream yourself into a deep sleep. This hammock stand with hammock will bring you endless hours of calm and relaxation. Ultra spacious, awesomely affordable and crafted to last a lifetime. And because this piece is made from the sturdy synthetic Texteline fabric were confident you'll appreciate the extra levels of stability and comfort this hammock offers. Hammock Stand with Hammock is rated 2.8 out of 5 by 4. Rated 1 out of 5 by Hardymsu from Low rider Once assembled and with my 130 pounds of weight on it, this hammock sits only a couple of inches above the ground. It also did not come with the advertised pillow. Rated 4 out of 5 by Jason from Great stand I have to give a four star rating because of the actual hammock. While the stand is quite sturdy and well worth the cost, the wooden part on the hammock that holds the shape of the bed is cheap. The hammock broke on the 3rd day of normal use and I was forced to either buy a new one for $80 or get creative. The wood they used was too thin and did not have a protective finish on it so I decided to untie the broken frame and make my own out of two large hardwood dowels (I replaced both ends to make it look nice). It has been 2 months now and I haven't had an issue since. It was a simple and cheap fix. The wooden frame looks much better than the steel ones and it is of solid quality. I may have just gotten a hammock that slipped passed the quality control persons radar so I still recommend this setup. It looks great and didn't cost too much. Rated 5 out of 5 by Mattjl from We love it!! This hammock is awesome!! Super high quality, and the sale price was significantly cheaper than other sites where I had seen the same hammock.